We are starting an investment fund from scratch and it’s not business as usual. The Buen Vivir Fund is the collective response of Thousand Currents and our partners to the need for a truly transformative approach to impact investing. Together, we are designing forms of investment that support grassroots economic initiatives to build wealth, community power, and wellbeing. The concept of buen vivir comes from Latin American indigenous movements and implies “right living” or life in balance with community, natural systems, and future generations. The Buen Vivir Fund seeks to promote financial models and practices that support communities’ holistic wellbeing, as opposed to focusing solely on maximizing individuals’ capital accumulation. Rather than those with the money imposing terms, the Buen Vivir Fund investment model identifies lending practices developed by grassroots groups themselves that are already proving effective on the ground. Together, the Buen Vivir Fund members uplift and apply these practices to the level of a global investment fund. Learn five ways the Buen Vivir Fund is unique in our infographic here. The Buen Vivir Fund launched its first round of investment in early 2018 to support nine remarkable projects led by organizations across Latin America, North America, Southern Africa, and South Asia. The total investment includes $427,700 in loan capital, $113,000 in grant capital, and investments beyond numbers among Fund members and ally-advisers via advising, learning-exchange, and sharing of tools and practices. The work of the nine projects spans a variety of sectors, including healthcare, housing, small business development for artisans and farmers, environmental and climate protection, and shifting practice in impact investment. All of the projects are powered by the membership or close collaboration with the local community. Many of the organizations focus on preserving or restoring Indigenous sovereignty. Over half of the organizations work on addressing climate change or environmental protection. Additionally, more than half of the organizations focus on women’s rights and leadership. 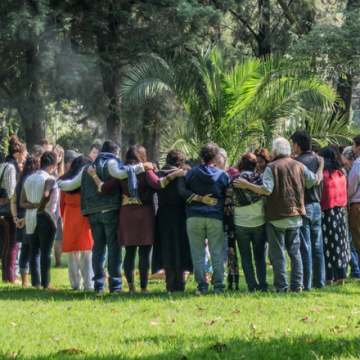 Whether grassroots organizations, foundations, family investment offices, or young investor collectives, all members of the Buen Vivir Fund are selected because they are leaders in practicing forms of investment that support people, communities, and the earth. Questions? Contact Rajiv Khanna, Director of Philanthropic Partnerships, at rajiv (at) thousandcurrents (dot) org. Together, Thousand Currents and NoVo Foundation have launched the Buen Vivir Finance Fellowship. This two-year professional development opportunity for seasoned financial professionals with at least 5 + years of relevant experience, allows them to learn from some of the brightest thinkers in the social justice and impact investing fields. Fellows play a critical role in supporting the implementation, development, and expansion of the Buen Vivir Fund and will be prepared to apply their learning as a practitioner of the model — influencing the field of progressive social impact investing for generations to come. Building relationships with grassroots partners in Africa, Asia, and Latin America, and connecting with a community of forward-thinking progressive social change funders, investors, activists and leaders, the Buen Vivir fellows work alongside the staff teams of Thousand Currents and the NoVo Foundation in Oakland and New York, respectively. Learn more about the Buen Vivir Finance Fellowship here. The 2018-2020 Buen Vivir Finance Fellows are Nina Sol Robinson and Gaithiri Siva! Insights from the Mayan Tzeltal cosmovision shared by María Estela Barco Huerta of DESMI. Doña Elvira Sanchez Toscano of Thousand Currents partner ISMUGUA shares on the importance of prayer and reflection in collective work.